In anticipation of LiterASIAN 2017, we are pleased to showcase interviews with our featured authors. Leslie Shimotakahara and Terry Watada discuss being simultaneously Japanese and North American, alongside their thoughts on fictionalizing the past while remaining true to it. Click here for more interviews with LiterASIAN’s 2017 featured authors. LESLIE SHIMOTAKAHARA | followed up her acclaimed memoir The Reading List (Variety Crossing Press, 2012) with her novel After the Bloom (Dundurn Press, 2017), which explored the imprisonment of Japanese-Americans during World War II. 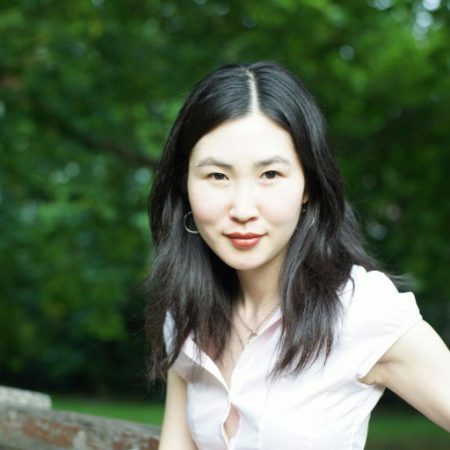 Her second novel is very much informed by her own family’s experiences as well as the documentary photographs of Manzanar camp. She and her partner currently live in both Toronto and Hong Kong. RP: You have written a memoir and fiction. How different are your writing processes for both types? LESLIE: Writing a memoir felt more straightforward. One has less freedom and flexibility in terms of the story one can tell, constrained at some level by what actually happened. Writing a novel, by contrast, is a bit like approaching a large, blank canvas—the anticipation is at once exhilarating and daunting. With so many more imaginative possibilities at play, I find fiction writing a more intense, time-consuming and challenging process, but also more gratifying, in the end. I’m more at home in the world of fiction. That said, the topics I’m drawn to in my fiction tend to, in various ways, spring from my own life, so there is some crossover in my techniques for writing fiction and memoir, though the subject matter is mediated differently. RP: You address the Japanese wartime internment in the United States in After the Bloom. Was it a difficult topic for you to write about? LESLIE: Surprisingly, it was not. While other sections of the novel I struggled with at length, the chapters set in the internment camp in California were the ones that came to me most easily and naturally. There is a wealth of research material out there, which provided me with a kind of imaginative springboard. Dorothea Lange’s documentary photographs of Manzanar—the camp where the infamous Manzanar Riot occurred—were particularly inspirational. My protagonist, Lily Takemitsu, is in part based on my paternal grandmother, who was interned at Minidoka in her late teens. Writing this novel allowed me to explore imaginatively the upheaval and dislocation that she endured, both physically and psychologically, along with some of the reasons why she became the rather strange, secretive woman I knew as my grandmother. RP: There is often a necessity to explain and interpret the past when it comes to Asian Canadian writing. Does this issue influence your writing in any way? LESLIE: When I was a young child, our family’s past and the Japanese internment in particular became very charged topics in my imagination. My maternal grandmother talked incessantly and shamelessly about the injustice she’d experienced — the smelly camps, the lack of privacy, all the property that had been confiscated. By sharp contrast, my paternal grandmother was always reluctant to talk about the past, claimed to remember nothing, and sometimes even seemed to deny that the internment had happened. Thus the internment and the ensuing postwar period caught hold in my childhood imagination, as a time that appeared veiled in contradiction and mystery, as well as a good deal of suffering. I suppose that writing After the Bloom has been my attempt, in a way, to explore and gain insight into that turbulent period. With so many more imaginative possibilities at play, I find fiction writing a more intense, time-consuming and challenging process, but also more gratifying, in the end. 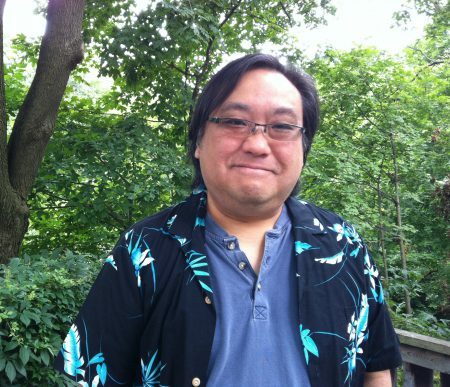 TERRY WATADA | His latest poetry collection is The Game of 100 Ghosts (Mawenzi House, 2014). The book is a lyrical tribute to his recently departed friends and family. He also writes novels, performs music, and works with theatre. His latest novel, The Three Pleasures, features a reporter from the pioneering Japanese-Canadian newspaper The New Canadian. RP: In addition to writing, you also dabble in music and theatre. How do you create so much output with so many commitments? TERRY: I don’t believe dabble is the right word for my music and theatre—10 albums released and 7 produced plays demonstrate that when I work the music or write a play, I am immersed in the process. My motivation is panic caused by deadlines. In music, I accepted gigs in various venues across Canada and the US. So I needed material, especially if I was playing with local musicians in, say, New York or Vancouver. With the concert date looming, I wrote and rehearsed quickly. As for theatre, I never wrote a play unless I was commissioned to do so. Again, deadlines inspired me. For example, Vincent, a play about a tragic encounter between the police and a schizophrenic outpatient, was written and rehearsed in less than a month before it was performed. Now, I admit I was lucky since the play was revived every year for the next 20 years. I really enjoyed the play being staged at the National Theatre in Ottawa and in Muenster, Germany. Not to mislead but my main passion is writing poetry and novels. I keep “in shape” by meeting the monthly deadline set by the Vancouver Bulletin (and the Nikkei Voice before that). I am forced to sit down, think about a topic and compose it. As you can tell, I’m not the kind that sets aside a specific time every day to write. RP: One of the characters in your latest novel, The Three Pleasures, is a reporter for the pioneering Japanese-Canadian newspaper The New Canadian. How challenging was it to maintain historical accuracy while also writing fiction? TERRY: I was fortunate enough to have met and got to know several staff members of that fabled publication. I even worked with some of them when I was Executive Director of the Nikkei Voice. So I had to maintain an accurate portrayal of those characters while placing them in historical situations. I had to ask myself how they would react in such positions. I hope I have been true to their memories. I would be heartbroken if I misrepresent them in any way. That is the true danger of writing historical fiction. RP: What makes you choose a particular topic to write about? TERRY: I choose topics based on the stories people tell me. After redress was settled in 1988, the floodgates were open. The first and second generations of Japanese Canadians felt free to tell their secrets. Through patient interviewing, I was able to delve into the deeper implications and particulars of the surface stories. Remarkable stories emerged as a result. The anecdotes were so compelling I worked to put them into an appropriate context. It was all in an effort to reconstruct a history, a community and personalities that were so well-hidden from me growing up in Toronto. I am now planning a third novel based on the true story of my childhood friend who robbed a bank in an effort to get redress for his WWII-victimized grandfather. I also have in the back of my mind a novel about my wife’s great aunt who died in the Hiroshima bomb attack. So I have a few things to keep me busy for years to come. I hope I have been true to their memories. I would be heartbroken if I misrepresent them in any way. 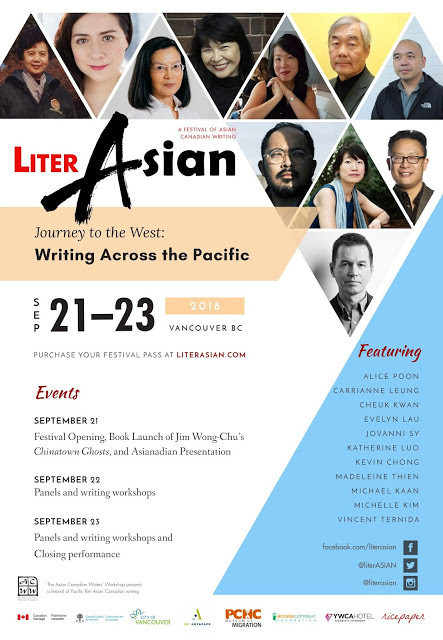 LiterASIAN 2017 takes place in Vancouver September 21-24. 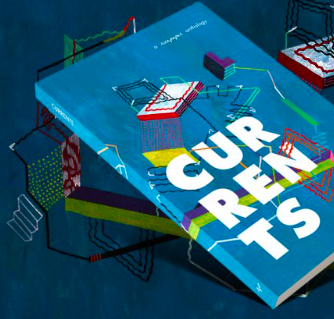 Meet Leslie and Terry at the book launches at Vancouver Public Library and the reception at International Village on September 22nd, where we will launch our long-awaited anthology.